These pictures reminded of Alex’s love for Rhino’s. 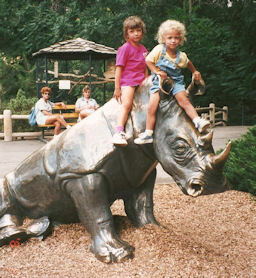 Alex has always loved rhino’s. They are her “favorite” animal which is a unique choice. 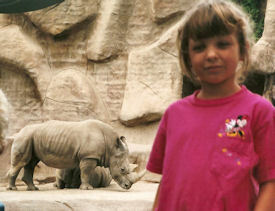 I am not sure what led her to the rhino, but she has always been an animal lover. We have been to many great zoos: Seattle, Portland, San Diego, Binder Park, Cincinnati, and Salt Lake City. We had passes to the San Diego Zoo when we lived in SoCal. Let me tell you the San Diego Zoo is definitely one of the top zoos around. We saw many babies of various animals in our trips to that zoo as it is a breeding zoo. Trips to the nursery were a must as it was not uncommon for them to have baby gorillas and chimps there. We even saw a baby gazelle right after it was born and was trying to stand for the 1st time. The San Diego Zoo had a baby rhino and we saw it grow up through our various trips there. I think that probably cemented her love of the rhino although she had called the rhino her favorite before then.